Posted on Wednesday, January 16th, 2019 at 1:40 am. Mike donated a kidney to his brother-in-law last month! This year has been an unforgettable journey. 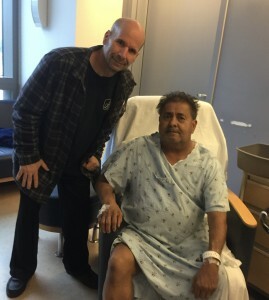 My brother-in-law was in serious need of a kidney. I was asked if I wanted to see if I would be an eligible donor. I was a direct match. Surgery date scheduled for December 4, 2018, at UCLA. Transplant was a success. His body accepted the kidney instantly. He’s doing very well. My recovery has been rough. I’ve never experienced the amount of pain I’m in. I wouldn’t change any of this. I’m called a hero over and over. I’m not a hero. I’m a man who saw another man in need of help. I’ve changed both of our lives for the better and that’s what means everything to me. The pain will pass in time. I overcame the obstacles and now he’s got a whole new outlook on life. Hello. Yes that’s my husband and my brother. My husband is a hero. He help my brother to have a better life.